Chickens that “chicken out” in unfamiliar surroundings may shed light on anxiety in humans, according to research published in the January 2016 issue of the journal GENETICS. Domestic chickens are much less anxious than their wild cousins, the red junglefowl. The new research identifies genes that contribute to this behavioral variation and reveals that several of the genes influence similar behaviors in mice. The authors argue that these results, combined with evidence from studies in humans, demonstrate the potential of the chicken to serve as a powerful model for understanding the genetic underpinnings of human behavior. But why choose the chicken as a model for anxiety? One reason is to take advantage of a “natural” genetics experiment, the transformation of red junglefowl in Asia into the modern domestic chicken. After thousands of years of breeding, the barnyard chicken has a different temperament to its jungle-dwelling counterpart: the chicken is more tame and less anxious. Anxiety behaviors in animals are typically measured by observing their activity in a brightly-lit, featureless space that they have never encountered before (an “open field test”). In this setting, wild junglefowl spend most of their time either frozen with fear or darting around rapidly. They also avoid the exposed center of the test arena. Domestic chickens, in contrast, move around the whole area at a less erratic pace. 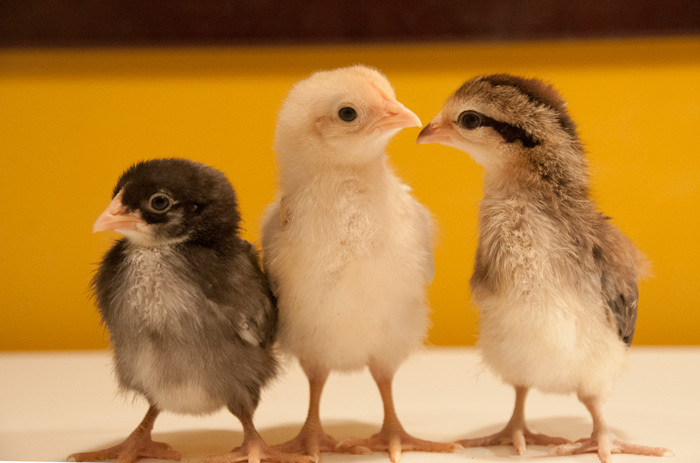 In addition, the chicken genome has properties that can make it easier to study than the human or mouse genomes. It is relatively small—around a third the size of the mouse genome—and it is grouped into smaller linkage disequilibrium blocks. These blocks are groups of neighbouring genes that tend to be inherited together, rather than being split up during recombination at each generation. Having smaller chunks gives researchers greater resolution in pinpointing genome regions associated with a trait. To look for genome regions that contribute to variation in anxiety behaviors, the researchers performed a quantitative trait loci (QTL) analysis on the hybrid offspring of White Leghorn domesticated chickens and red junglefowl (using an experimental design called an eighth generation advanced intercross). The hybrid birds inherited a patchwork of gene variants from their chicken and junglefowl ancestors and varied widely in their anxiety levels as measured by the open field test. By correlating the behavior and genome data for each bird, the team identified fifteen QTLs that contributed to the variation in behavior. Each of these genome regions included many genes, so the next step was to hone in on specific genes of interest. The team narrowed down the search by examining the candidate genes’ activity in the hypothalamus, a region of the brain involved in regulating anxiety. The team examined expression QTLs—sequence variants that affected hypothalamic expression of a nearby gene— that were located within one of the behavior QTLs. These were considered plausible causal variants if they influenced gene expression in a pattern that correlated with the behavioral variation. For instance, the expression QTL might confer low expression of the candidate gene in individuals with high anxiety or vice versa. Ten genes that fit these criteria were identified, of which six have previously been shown to have functions related to behavior. For example the gene ADAM10 is needed for embryonic brain development and protection against amyloid plaques in neurodegenerative disease, and influences learning and memory. They then tested whether these ten genes also influenced behavior in studies of mice and humans. The mouse data came from a massive ongoing breeding experiment called the Mouse Heterogeneous Stocks cross, which includes behavioral data from open field tests just like those used in the chicken study. Four genes identified in the chicken data were also associated with anxiety behaviors in mouse. In several cases, the genes influenced the same aspect of the open field test —activity— for both mouse and chicken. The candidate genes were also examined in data from human genome-wide association studies (GWAS). Three genes were associated with schizophrenia or bipolar disorder. Although anxiety behaviors were not directly measured in the human studies, the authors argue that results for other disorders may be revealing. For instance, a large proportion of people with bipolar disorder have diagnosed anxiety disorders. There may also be some complex overlaps between schizophrenia symptoms and anxiety behaviors. Using data from animal experiments to explore human GWAS in this way can help detect associations that would otherwise be difficult to distinguish from statistical noise, says Wright. Because GWAS often include huge numbers of markers, they must be analyzed using very stringent significance thresholds that could obscure true associations. How constant is this variation?